[By Nick, New for 2016] It's crazy to think today marks 4 years that Dubba has let me spout out my thoughts about frozen desserts to you all. It feels like just yesterday I was asked to join On Second Scoop so I'd stop harassing Dubba with emails about my opinions on flavors he's reviewed or was planning on. Or at least that's why I think he let me join. This past year has been pretty hectic for me but I won't be disappearing just yet. Until I find my way into an ice cream company (which will happen) I'm going to be reviewing as much as possible. Our community has become somewhat a second family to me and it still amazes me how much it grows year to year. You all make On Second Scoop the site it is today. Without you, I'm sure Dubba and I would've called it quits but you all have been here with us through the highs and the lows. I couldn't thank you all enough for what you've done for me as an individual. I went from a socially anxious kid with a passion for ice cream to someone with confidence and a promising future in the sweets world. I owe all of it to you guys, no doubt about it. Okay, before this gets too emotional, let's review Starbucks latest frappuccino which is inspired by the ice cream world. I love caramel, I've grown to love coffee, and waffle cones are the only cones ice cream should ever touch. It honestly sounds like a winner on paper. It looks like a winner in person as well. Oh how I love the look of the caramel and waffle cones on top of the whipped cream. Taking my first sip, I'm not impressed at all. 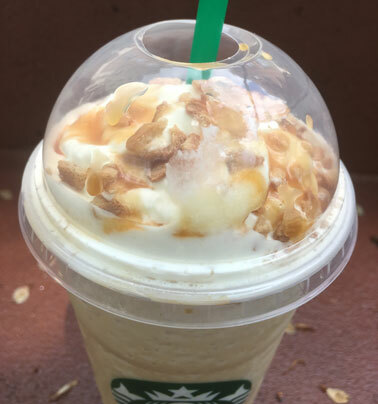 It tastes like a standard caramel frappuccino. I was hoping they would blend some of the waffle cones into the drink but that's not the case. If you want them, you need to ruin the pretty whipped cream and mix the handful of pieces into the drink yourself. I honestly was expecting more from this drink. I'm not a fan of companies slightly changing something and calling it new when it's far from the case. I'm not sue who would want something just sprinkled on their whipped cream but if that's the case, this frapp is for you. As is, I think Starbucks needs to get a new product development team. S'mores Frap was good, but nothing mind blowing. Glad this one was not worth the $$ saves me from buying one. The tuxedo is one that does not get enough love. Wow, you got a venti, you really took a leap of faith there haha xD I agree though, very disappointing and just about identical to the caramel frappuccino, but I honestly think I would take the caramel frappuccino over this one since they use caramel drizzle whereas the only topping on this is waffle pieces, making it slightly less caramel in comparison. Are you telling me that you don't mix the whipped cream into the drink anyway? I thought everyone knew to do that. 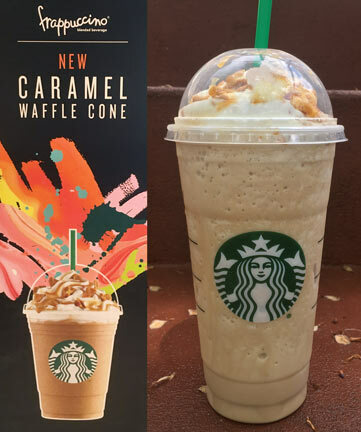 FYI the caramel frappuccino has coffee in it; the caramel waffle cone frappuccino is a "creme frappuccino" (does not contain coffee). OH never mind, I guess you can order it as either a coffee frappuccino or a creme frappuccino! Usually only kids need to be told. It's one of those things that's generally intuitive. I love caramel waffle cone flavored ice cream so I was really excited for this. I actually think this is worse than the caramel frap. Mine had a slightly burnt taste that I felt like was coming from the syrup, not the coffee. And it wasn't burnt in the good way like with toasted graham. Also, I felt like it just tasted especially artificial. Not a fan. Sorry thats wrong. You dont mix the whipped cream on top into the drink. Its not like having it at all then it all melds together. What you do, correctly, is ask for your frappuccino to be made with heavy whipping cream instead of milk. That is what you want if you want the richest frappuccino. And you can keep the whip on top too. Thats a different whip, not the same as heavy whipping cream. I agree that they need a new development team. All they do is remix existing flavors and give them a new name, like they did with the red velvet frappucino. With that one, a cream cheese frosting-whipped cream would've been great, but they're not that creative, I guess. I loved the waffle cone. Yeah it wasn't what I expected but it was still good. Definitely one of my favorite drinks there.